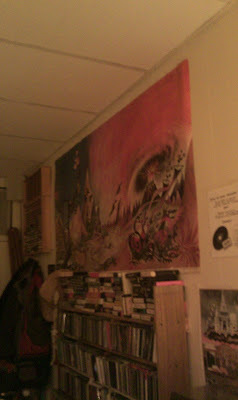 I recently saw a copy of the 6' by 3' poster in a coffee shop.... amazing. made me feel the need to scan my copies of these books into the same scene. but maybe next time there is a good sale on large photo printing i will print this. Click the photo to make it big enough so it looks good. These are my ballantine books 1968 21st printing editions of these books first printed in 1965. To get a sense of the magnitude here is the poster at morning glory coffee shop in pittsburgh. if you live in pgh I definitely recommend this coffee shop. I have one, how can I frame it? How to frame a huge poster for about $20. here is the result of my framing effort. 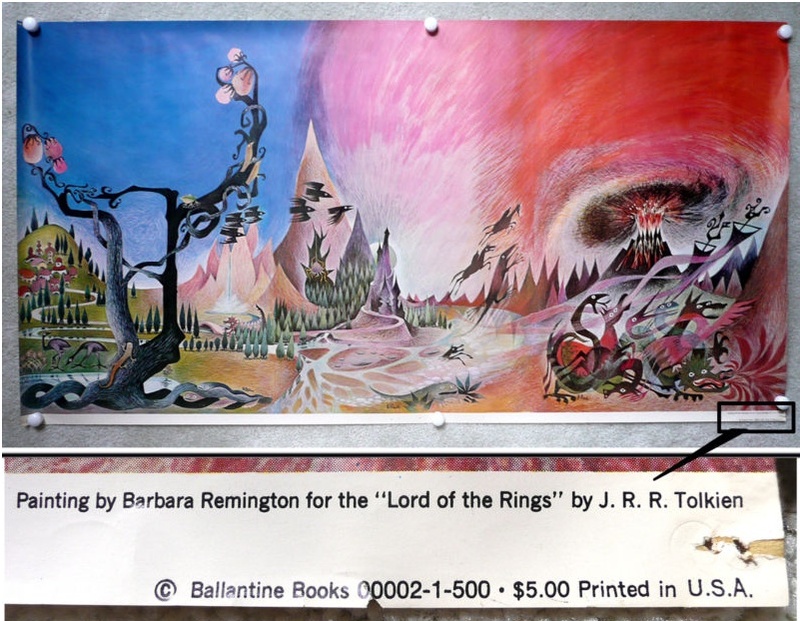 How much should a lord of the rings Barbara Remington poster sell for? good question. hard to know what it is worth when it is only intermittently for sale. I am going to try to track ones that come up for sale here to get a good idea. This one went up to 112 + 10 shipping but did not meet reserve. Looked like it has some pretty beaten corners and the description said it had rips that had been taped. A second posting went up to 150 but still did not meet reserve. "The edges, especially the two short edges, are somewhat frayed (as can be seen in the photos). 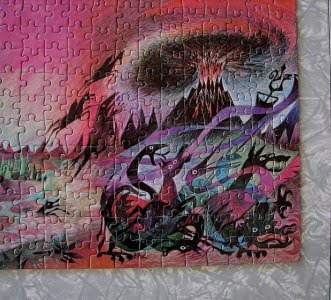 Both the left and right bottom corners have small pieces that have been torn away (again, see photos). The poster does have 3 tears within the picture itself. A photo of each has been added, with text indicating the location of the damage. Over the years, tears in this poster have been repaired by a variety of different kinds of tape. The most recent tears/nicks have been repaired with acid-free, scrap booking tape." Sold for 139 + 7 shipping. click to see the full size image. as you can see there is some fairly significant edge wear but seems to be in pretty good shape otherwise. Special bonus for linking to me! "Perfect holiday gift for the Lord of the Rings enthusiast. These posters are becoming very hard to get. I bought this one in the 70's and had it on my wall for a few years. It then went into a mailing tube and into storage. I recently found it again and offer it for sale. The edges are fairly severly damaged in multiple places. I have photographed the areas carefully so there will be no surprises. The entire interior of the poster is in very good condition. It has not faded at all and has never been folded. If carefully mounted or framed I think most the edge damage could be covered or camoflaged. If you are unsure of any of the damage please ask me questions. I am not set up to do returns.The poster is huge - almost 7 feet x 38 inches. See http://mike-is-bored.blogspot.com/2009/10/barbara-remington-lord-of-rings-poster.html for more information on the poster and some ideas on how to frame it." 181+6 shipping. Reserve was not met. 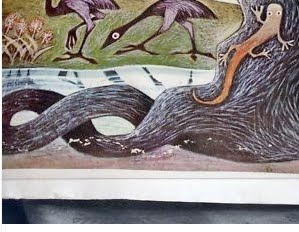 The poster measures 37” x 72”. It does have some edge tears and small chunks of edge missing, holes from thumbtacks, and some double-stick foam pieces attached to the back side. Nonetheless, it was never folded, always rolled, and the colors are still vibrant after 40 years. I’m sure a lot of these issues could be minimized or masked entirely by mounting it on a foam board and framing it to hide the ragged edges. This one with water damage along entire bottom went for 102+ 12s.There is a small 1/2 inch tear at the right side. There is a 2 inch water stain all across the bottom. This is more apparent at the back of the poster than in the front. In the front it manifests chipping along the water line at the far left, and at a few other locations across the bottom (see photos). In spite of this the poster displays beautifully! There is a series of 3 sets of small holes spaced 6 inches apart at the top right of the poster. The best condition one i have seen sell yet went for 239 + 13 shipping. "There are thumb tack holes at the corners and each long side and a small tear (see photo) along one edge. I just found one other similar tear near one corner. There are six tiny pin holes in the blue sky area on the left side and four pinholes in the bright orange/pink sky area---these are very insignificant and do not detract. There is a small piece of masking tape on the back of the poster reinforcing the thumb tack holes (photo shows one of the corners)." 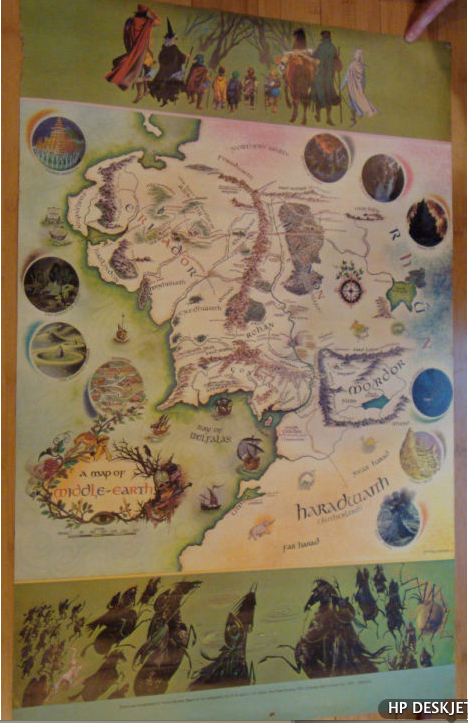 Another similar poster "come to middle earth" went for 56 + 15 shipping. That poster was on the wall in my college dorm. 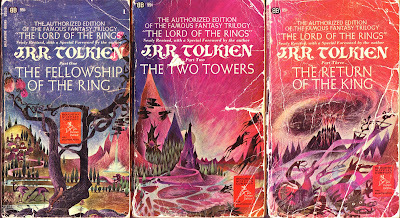 I never realized that is was the book covers, and I had the same edition! I think that is one of the reasons it is so cool. I like that the poster has no writing or any real indication what it is about. Do you know what is worth the poster in a very reasonable condition? I bought a bunch of old posters at a garage sale and realized I have that poster. there is one up on ebay right now you should watch. it is a little banged up. I think it is for 170 or so buy it now and the auction is at ~80. I would buy at a reasonable price. 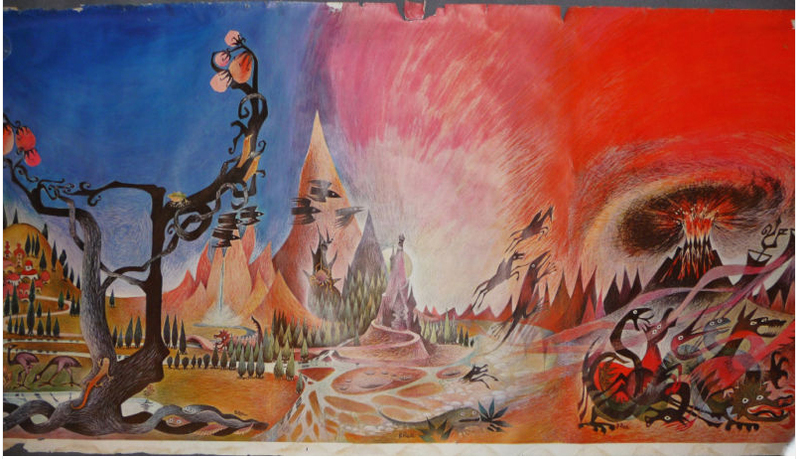 My favorite - my friend was painting this on his wall (OK, this was like a a long time ago, back when the Earth was still cooling). Anyway, he had it almost done, all that was left was the waterproofing, so of course the rain came, and water ruined it. I have the puzzle framed on the wall in my office. It was on the outside of his house? that is amazing. bummer that it rained would have loved to see a photo of that. Remington also did a map. ballantine sold it as a poster circa 1967 for $1.49. I bought one new in 1968 or so and immediately framed it on the back of a piece of paneling with a homemade frame, so it's been flat its whole life. It is currently in my office at work and is pretty much mint condition. I use a picture of it as my screensaver, as well. I've been offered $400.00 for it, but won't sell it. I'd send a photo, but don't know how (over 50 club). I got one in really good conditon for ten dollars at a rummage sale a few years back. Haven't have the $ to frame it so it was rolled up and waiting. 7 year old just cut a 6 inch square out of the top right corner (for origami) the child is likely to survive, children do, but is like as unhappy about the yelling as I am about the damage. My mom found one in my Grandparent's attic after they passed away. She wasn't sure if it was hers or her sister's, but she gave it to me and I had it hanging in my first apartment over the couch. Got a small rip because the wind blew as I was putting it up, almost made me cry, but it's small. Now that I'm a real grown up we're probably going to mount it between plexiglass and use standoff mounts for our media room. I love that poster so much!